Yesterday Salt, the publishers, announced on their twitter feed (which I love) that this week is Salt Summer Reads Week. They invite readers to buy/read/review books published by Salt and spread the world. 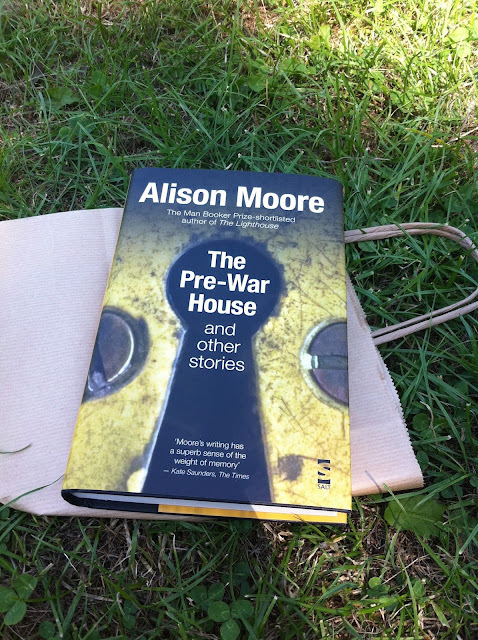 Salt came on my radar when I read Alison Moore's The Lighthouse and ever since I have kept an eye on what they have been doing. I kinda figure that anyone who would publish The Lighthouse is worth my overenthusiastic attention. This announcement was actually a massively coincidental moment because last weekend I discovered my local bookshop (Kennington Bookshop, which is totally amazing) and in it I found Moore's short story collection The Pre-War House. I finished this spread out in the park as I slowly roasted on Sunday afternoon. So I thought, what better time than Salt Summer Reads week to write and post my review? I couldn't think of a better time so here is my review (took a while to get there, I agree). I adored Moore's debut because of the mix of simplicity and complexity in her circular narrative. I was not let down by this collection. In fact, Moore is fast becoming one of my favourite authors. This is a collection of twenty or so short stories of varying lengths and very varying subjects. Yet whilst the subject matter is different in each there are several underlying themes which crop up in each story. Things like the nature of memory, family breakdown, secrets and lies and a general sense of the past creeping up on each of the characters. Some of the stories are soaked in sadness and loneliness and some of the stories are seriously sinister and sent multiple shivers down my spine. But this is not overt 'horror' (for lack of a better word), rather she creates an atmosphere of discomfort pervaded by that niggling feeling that all is not quite as it should be. Clever stuff. I found this in The Lighthouse too; Moore has this skill of saying so much more than she actually does. As most of you know (because I haven't stopped talking about it for a while), I am reading Anna Karenina. When I finished this collection that famous first line from AK popped into my head and I realised it is perfectly matched to this book. Many of the stories centre around families, all of whom on the surface seem relatively happy (reading some of these stories made me realise that Tolstoy is a complete genius and speaks the truth about families). It is not usually until the end of the story that something is revealed that destroys that assumption of normality. Seriously, some of these revelations felt like a slap round the face, almost like Moore was shaking me and saying 'how did you not see this before?!' A couple of the stories I even re-read after that vital thing had been revealed and it becomes so clear that something is wrong, not obvious, but the word choices are trying to tell you something. Quite often in story collections there is one that really sticks out as a favourite. Here I find myself unable to pinpoint just one. Every single story is brilliantly written and structured and has a original storyline. There are a couple that I will highlight for a special mention: 'When the Door Closed, it was Dark', 'Overnight Stop', 'Sometimes You Think You are Alone', 'Small Animals', and the title story 'The Pre-War House'. Each of these stories surprised me in some way, made me feel uncomfortable (as only a well crafted story can), and left me questioning my own ability to perceive good and bad or right and wrong. In a nutshell I would highly, HIGHLY recommend The Pre-War House. It is emotive, it is chilling, it is a gem to read and I could not put it down (no matter how hard I tried to make the experience last). I think exploring Salt's entire catalogue is the only way I can move on from this book. I'm particularly interested in their anthologies of Best British Short Stories. Can anyone recommend a good year to start with? Great review Ellie. I really want to read some more short stories and this sounds like it could be a great place to start. Salt seem to be one of the few publishers championing short stories, unless I'm mistaken. Thanks Lindsay. I think this would be a great place to start. I think short stories can be a bit hit and miss and times but this is a constant hit. I think they are and I really like them for that!